The Ultimate Cholesterol Lowering Plan© online Shopping Tour video launch - rundown and summary of the event! Posted on Oct 24, 01:37 PM in Editorial. No comments. 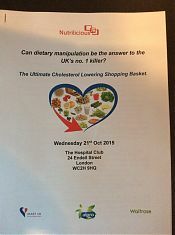 On Wednesday evening, 21 October, I attended the launch of the new Ultimate Cholesterol Lowering Plan© and Ultimate Cholesterol Lowering Shopping Basket store tour video. Have you ever wished you had your own Dietitian to join you on your grocery trip? Well now you can- well in a “virtual” sense anyway! The store tour video features Dietitian Lucy Jones, who takes you on a mini-supermarket tour, pointing out which are the best choices for your Ultimate Cholesterol Lowering Basket©. 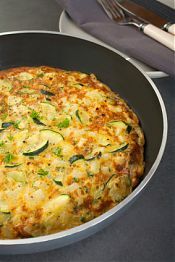 Looking for the Ultimate Cholesterol Lowering Diet? Find it during National Cholesterol Month. Posted on Oct 18, 01:02 PM in Editorial and Well Being. No comments. October is National Cholesterol Month in UK and time to remind ourselves about the disturbing UK coronary heart disease statistics. 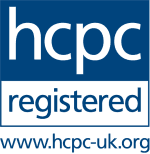 When it comes to causes of death in UK, Coronary Heart Disease (CHD) is the big hitter. It is simply the biggest single killer in the UK alone. 2015 statistics show that almost 70, 000 deaths each year are due to CHD. Scotland and the North of England, where I live, have the highest rates in the nation. Should I eat "white meat" rather than red? Posted on Oct 17, 10:47 PM in Well Being. No comments. There used to be a time when the recommendation was to avoid red meats and go for “white meat” when considering cholesterol and cardiovascular risk. The usual fare for people trying to keep their fat intake down was chicken, chicken and more chicken! But it doesnt necessarily need to be all “white meat”.